Offering our clients a wide range of HVAC Instruments that includes dew point transmitter, Humdity & Temperature Data logger, Air velocity transmitter and Thermo hygrometer. The HygroFlex5-series is the latest development in transmitters for Humidity and Temperature Transmitter and dew point. One outstanding feature of this innovative product is the possibility to output any psychrometric calculation as an analogue signal. The HF5-series is compatible with HygroClip2 probes with integrated AirChip3000 technology - thanks to which the probes achieve an unparalleled degree of accuracy not seen before. 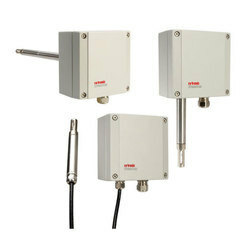 In combination with advances in sensor technology and integration, the HygroFlex HF52, HF53, HF54, HF55 and HF56 transmitters combined with a HC2-S probe provide superb precision and state-of-the-art functionality, taking humidity and temperature measurement to a whole new level of accuracy < 0.8 %rh and < 0.1 K at 23 DegreeC. The new HygroFlex3-series is the latest development in Rotronic HF3 Series (Space, Wall & Duct Type)transmitters for relative humidity, temperature and dew point. 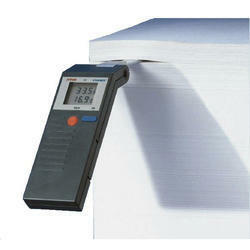 Based on AirChip3000 technology, the instruments achieve a degree of accuracy not seen before. In combination with advances in sensor technology and integration, the HygroFlex3-series provides superb precision and state-of-the-art functionality, taking humidity, temperature and dew point measurement to a whole new level of performance and reliability (< 2 %rh / 0.3 K). 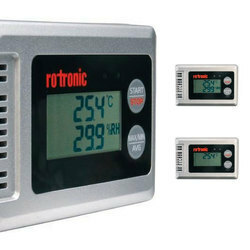 The new Rotronic HF4 Series is the latest development in HVAC transmitters for relative humidity, temperature and dew point. Based on AirChip3000 technology, the instruments achieve a degree of accuracy not seen before. In combination with advances in sensor technology and integration, the HygroFlex HF42, HF43 and HF45 transmitters provide superb precision and state-of-the-art functionality, taking humidity, temperature and dew point measurement to a whole new level of performance and reliability (< 1 %rh / 0.2 K). EE85 is optimized for building automation as well as for process control applications. 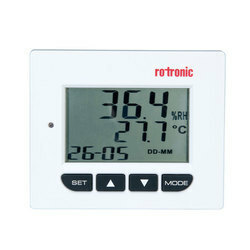 It measures Duct Mount CO2 Transmitter (EE-85) concentration based on EE85 the Non-Dispersive Infrared (NDIR) technology. A patented auto-calibration procedure compensates for the aging of the infrared source and leads to outstanding long-term stability. The air from the duct flows through the probe into the EE85 enclosure and back into the duct. Inside the enclosure, the air diffuses through a membrane into the CO2 sensing cell. As there is no flow through the sensing cell, this is very well protected against dust. EE85 is available with measuring ranges of 02000, 05000 or 010000ppm and with two probe lengths. The switching threshold and hysteresis can be set with potentiometers on the printed circuit board. The mounting flange included in the scope of supply facilitates installation in the ventilation ducts. The robust multifunctional Hand held Air Velocity Transmitters the highest requirements and comes with a wide range of accurate probes that fit various applications. Use touch-screen navigation to show, up to three measurement values simultaneously on the capacitive TFT display. A total of 23 measurands (vary according to probe) is available, including. Store measurement values in the internal memory of the device and use the free SmartGraph3 software to manage data on your PC. The optional carrying case accommodates the hand-held and probes, as well as accessories. The Omniport 30 offers both continuous and single-point data-logging. The measurement values of up to three channels are stored simultaneously, together with a time and date stamp, in the internal memory of the device. Stored measurement data, as well as the minimum, maximum, average and standard deviation values, can be shown directly on the display. Scroll through a recorded measurement and switch between graphs by using the control cross. Data management is easy and intuitive by using the free SmartGraph3 software to create graphs that contain measurement channels of interest for better data analysis. Data can be exported in .csv format and then imported into EXCEL for further processing. 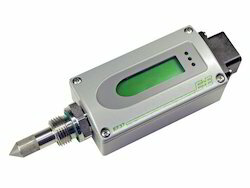 The EE75 series air velocity transmitters were developed to obtain accurate measuring results over a wide range of velocities and temperatures. A high-quality hot film sensor element based on cutting-edge thin film technology ensures maximum sensitivity, even at lowest mass flows. At the same time, the innovative probe design produces reliable measuring results at high flow velocities of up to 40m/s (8000ft/min). 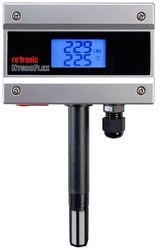 The integrated temperature compensation minimises the temperature cross-sensitivity of the EE75 series which, combined with the robust mechanical design, allows it to be used at process temperatures between -40 to +120 DegreeC (-40 to 248 DegreeF). In addition to air velocity and temperature values, the transmitter calculates the volumetric flow rate in m/min or ft/min. The cross-section of the duct needs to be determined for this purpose and the volumetric flow rate can be displayed and directed to one of the analogue outputs. The configuration software included in the scope of supply allows to choose the appropriate output parameter and freely scale the display range and signal level of the two analogue outputs. 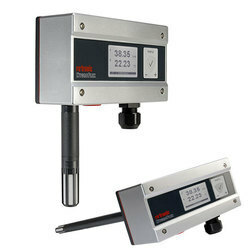 In addition user-friendly calibration of the air velocity and temperature and the adjustment of key parameters (e.g. response time of the velocity measurement, low flow cut-off points, etc.) are supported as well. 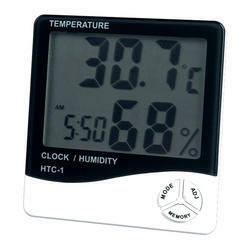 An optional illuminated display with two control buttons integrated into the cover is available. In addition, this enables changes of the configuration to be made directly on the unit. The EE75 series has a robust metal housing to protect against possible damage in rough industrial environments. There are four different models, providing a comprehensive range of mounting options. 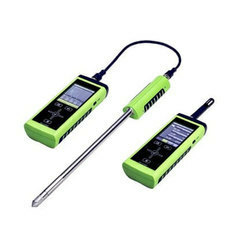 The EE75 series can be used to measure the velocity of other gasses as well, although a correction has to be applied to the unit at the factory. The EE660 air velocity transmitter is dedicated for accurate and reliable measurement in building automation and ventilation applications. EE650 employs the new VTQ air velocity sensor element, which operates on the thermal anemometer principle and is manufactured by E+E in state-of-the-art thin fi lm technology. Due to its innovative design, the VTQ sensor element is very robust and highly insensitive to pollution, which leads to outstanding long-term performance. The measuring range 0-10/15/20 m/s (0-2000/3000/4000 ft/min), the output signal 4-20 mA or 0-10 V as well as the response time 1 or 4 seconds are selectable by jumpers. 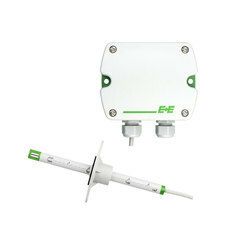 The enclosure design and the mounting fl ange included in the scope of supply allow for easy installation or replacement. 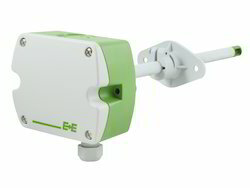 EE660 can be adjusted by the user via digital interface. The E+E thin film sensor used in EE660 operates on the hot film anemometer principle, which stands for excellent accuracy down to 0.15 m/s (30 ft/min) and high insensitivity to pollution. The measured data is available on the current and voltage outputs (both signals are available on the terminal) as well as on the optional LCD backlight display. The measurement range and the response time can be selected via a jumper. Low angular dependence and the mounting flange enable easy, cost-effective installation. An optional kit facilitates easy adjustment of EE660 and configuration of the display. 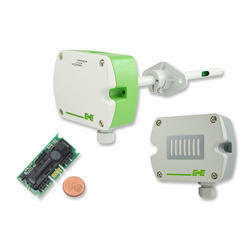 We are offering Dew Point Transmitter to our client.